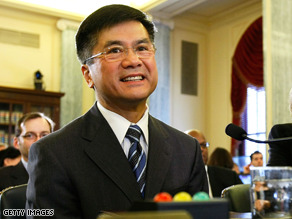 The Senate confirmed Gary Locke as Commerce Secretary. WASHINGTON (CNN) - By unanimous consent, the Senate Tuesday confirmed former Washington Gov. Gary Locke to be Secretary of Commerce. Locke was President Barack Obama's third choice - New Mexico Gov. Bill Richardson took his name out of consideration on January 5, citing the distraction of a federal investigation into ties to a company that has done business with his state. Republican Sen. Judd Gregg of New Hampshire - Obama's second Commerce pick - cited "irresolvable conflicts" with the administration over the economic stimulus bill when he withdrew his name from consideration on February 12.